I had trouble catching up with Szabolcs KissPál because he was very busy in December with the Free Artists (Szabad Művészek) protests against the recent political changes to the cultural scene. Luckily in the New Year I had a chance to sit down with him and talk about his art work as well as recent activist role. 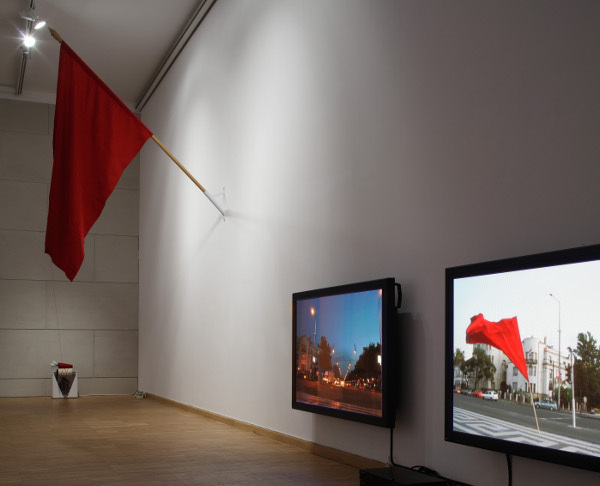 KissPál uses different media, often video but including photo, installation, and sculptural objects, in detached but at times critical and at times poetic examinations of society. He showed me some of the major projects in his portfolio, including Parallel Gazes, a photography project that dealt with the gaze of monuments and former monuments related to Marx in Budapest and London. 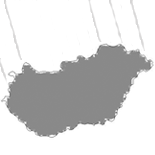 In other works, some symbols reappear, such as clocks and, more pertinent to my area of interest, flags. So we briefly considered Utopia battery (2008), Lifesize Draft (Utopia Battery) (2009), and Rever (2000-2006), projects in which the ‘sacred’ entity of flags and all they represent are unraveled or inverted through visual distortion or physical manipulation, and so the symbology of them is questioned. 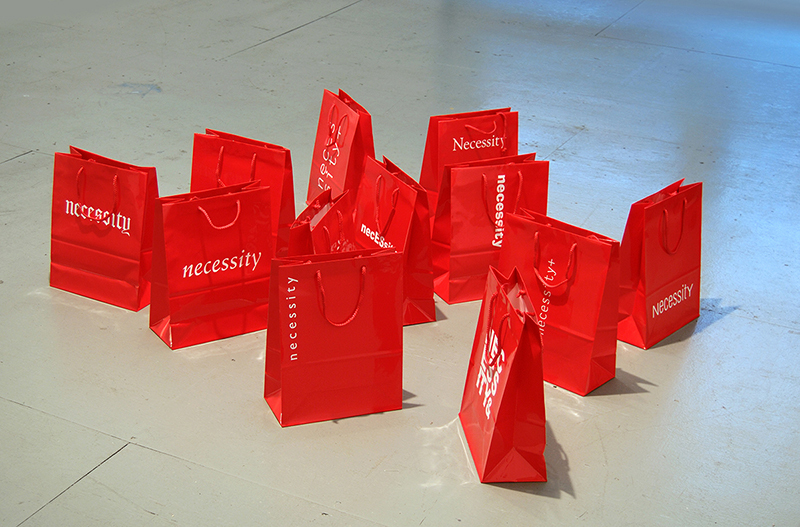 Surplus (2010) is an installation KissPál created as part of his residency at ISCP in New York. This economically concerned critique deals with Marxism, using a print from the Parallel Gazes project, but also work, money, labor, and values of production in today’s economy, America’s consumer society, and for an artist. While KissPál noted his reference to Marx’s concept of surplus value, I can’t help but think of shopping bags as the ever present arm accessory of New Yorkers as well. KissPál explained two of his older video works that I might find of interest. Shards of Glass (2003) was shot near Vienna in a large cemetery which included both Jewish and Catholic graves, which he says is uncommon. The video follows a deer as it appears, runs, and reappears in the Jewish section of the graveyard. In this way, he draws a parallel between the origin myth of Hungary, where settlers were led to the land by deer and it was the birth of a nation, and the present day and its relation to the Jewish community, where in a mixed graveyard is haunted by a deer that flees. The second video he showed me, Anthem (2001), was simple—a group of women singing. Yet the young women were singing the lyrics of the Hungarian national anthem to the tune of the Romanian national anthem. This was considered offensive to both sides of the border, but more so to the Hungarians. Like with the flag projects, the negative reaction stems from a reverence toward nationalist symbols similar to that often given to religious symbols. 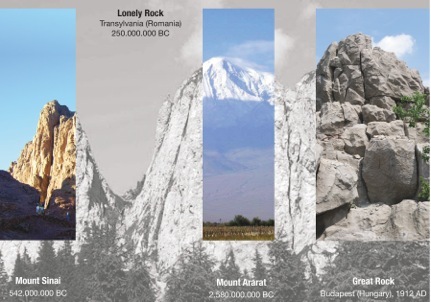 As an ethnic Hungarian born in Transylvania (Romania) who lives in Hungary, how society conceives of these two national identities, especially given their contentious borders, is of interest to the artist. The third video KissPál showed me related to his most recent project Amorous Architecture. Taking the Budapest Zoo as his subject matter, Amorous Architecture consists of text and video work made in conjunction with the ‘book as exhibition’ project Zootopia, which deals specifically with zoo architecture. This docu-fiction contribution and video project tells the history of an artificial mountain in the Budapest Zoo while linking it to nationalism’s darker side of colonialism and the historical tensions surrounding the region of Transylvania. Budapest was once known for having a great zoo, constructed around the turn-of-the-century when nationalist pride was often being displayed through public architecture. The zoo’s architect was from Transylvania, which was later annexed to Romania in the Treaty of Trianon in 1920 despite the large Hungarian population, and he introduced Transylvanian elements into the design of the zoo, which the Hungarians then considered typically Hungarian. Colonialist countries would also show “natives” of theirs or other lands in zoos of this period in the form of ethnological expositions or human zoos. Here enters the fiction to this factual account. KissPál in his video constructs a narrative about the interwar semi-Facist leader Horthy as displaying Transylvanians in the Budapest Zoo. There are a lot of nuances to this narrative—about turn-of-the-century Hungary, the status of Transylvania to Hungary, the role of Horthy as a leader, zoos, and the retelling of history. One of the challenges KissPál dealt with in making this work is lucidly referencing Hungarian history, an issue the artist sidestepped in his previous conceptual works that did not require extensive explanation for an international audience. As I mentioned, KissPál has spent a lot of time organizing, informing, and protesting the recent political and funding changes to Hungary’s public cultural institutions. 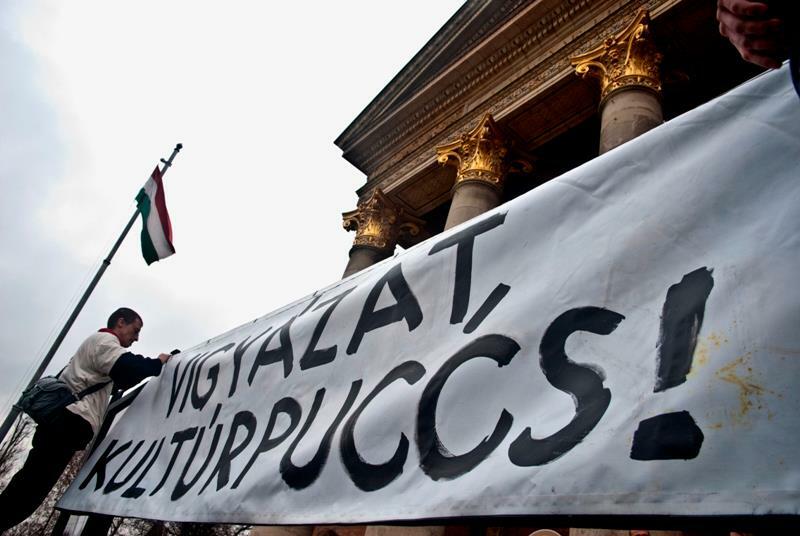 The Free Artists group, whose statement can be found here, oppose the appointment of the Hungarian Academy of Artists (MMA) as the controller of Hungary’s cultural budget and as owners of the formerly State-owned building of the Kunsthalle in Budapest, among other things. Their motto is “The MMA is discriminatory, but art is free.” They have appeared at three public events related to issue of the MMA so far to express their dissent, and were forcibly ejected from the first meeting. This treatment as well as other issues around the legality of the MMA’s status and controversy around the MMA’s leadership has led to the resignation of 11 members of the MMA so far. It almost goes without saying that it is an interesting time to have a critical artistic practice in Hungary. Note: There was a fourth protest, a flash-mob in front of the Kunsthalle, on February 19, 2013. This entry was posted on January 10, 2013 by linnea8 in Artist Meeting.